Summer may be over (that’s if you’re reading this after August). But it’s certainly not too late, or too chilly, to try the year’s best summer cocktails. Still thirsty? We’ve got four recipes that are sure to blow you cocktail-loving mind. They can even slide into the autumn months with you. Easy crafting, easy drinking, and easy transition! Our cocktail enthusiasts are here with favorite classics, new finds, and their own concoctions. Give your attention to our neighbors across the pond: Mike @barflys.and.dreams, the head bartender at Bristol’s @farawaycocktailclub, and Francesco @theworldofthebar, a gentleman that Capri can be proud of. Following them on Instagram is a must. So, yeah: you probably want to do that right now. Blend all ingredients on high with a large scoop of crushed ice. Pour into whatever glass you like. It’s boozy, cold, and utterly perfect for summer. Francesco said his favorite cocktail was the classic martini. Make it dirty. Check out our recent article: 5 Best Martini Recipes: Alternatives to Savor and Share. There, you’ll find the classic recipe, along with some new takes and twists on this iconic, sophisticated drink. That’s right! 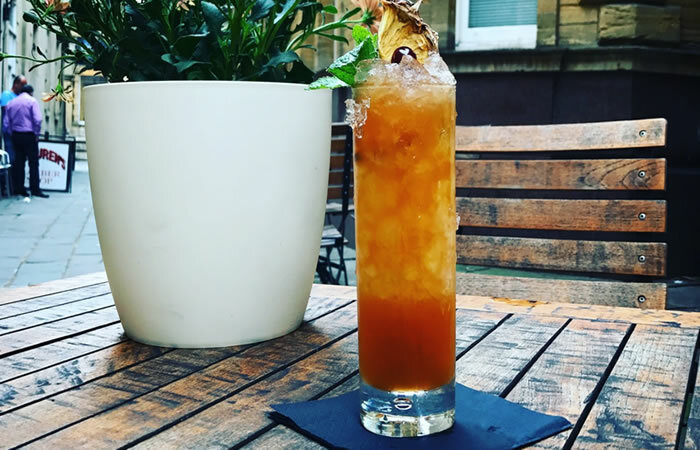 As fall approaches, you don’t have to say goodbye to these summer cocktail wonders. Summer is bright with blue skies, sunshine, and green grass, but autumn need not be dull. It boasts a brightness all its own! Irresistible, multi-colored foliage is complemented by vibrant cocktails that can warm you up as quickly as they cool you down. ● 1.5 oz. Martell V.S. Add all the ingredients to a highball. Fill it with crushed ice, and give it a good swizzle/churn. Top with more crushed ice, and garnish with a mint sprig. Francesco says it’s sour time! So he’s giving us a beloved favorite, his “Madame Gutier” cocktail recipe–perfect for any season. Shake and strain into a goblet. Garnish with lemon. Don’t forget to follow our enthusiasts at @barflys.and.dreams, @farawaycocktailclub, and @theworldofthebar. And don’t leave before you shop our Prestige Decanters online store. For sure check out our whiskey glasses to take your cocktails to the next level, no matter the season. We invite you to share your best summer cocktails in the comments below. The more the merrier!